Everyone should at least know the name of this star. Betelgeuse is a red supergiant, one of the largest stars known (up to 1000 Solar radii) and the 9th brightest star in the sky. It’s also one of the few stars whose surface can actually be directly imaged as a disk! This actually allows us to see some of the features in the star’s photosphere! But the point I find interesting (which, for some reason, I never wrote about in November when it was released) is this image taken by JAXA’s AKARI space telescope. 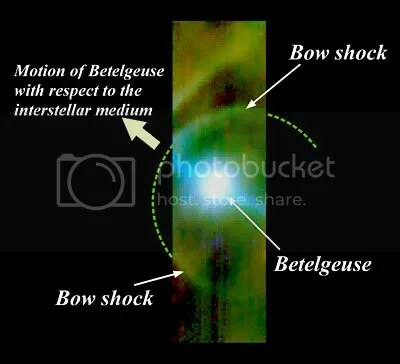 Clearly visible in the infrared is Betelgeuse’s bow shock. I’ve written about those before; the shock front created by a star’s motion through the interstellar medium. Being a supergiant, Betelgeuse has a leisurely stellar wind speed of just 17km/s (which will be about the same as its surface escape velocity). This hits the surrounding interstellar matter and puffs a big bubble in it. The collisions generate some heat, and heat causes infrared emission — the result being that an infrared telescope like AKARI can image that infrared and reveal the bow shock itself! Oh, and incidentally, Betelgeuse is quite a good candidate for a type II supernova at some point in the near future. Don’t worry though — at a bit over 600 light years away, we’ll be quite safe. Though it would be easily bright enough to read a book by it in the middle of the night! Credit and respect to Ueta et al for this remarkable piece of telescopic wonderment! This entry was posted in astronomy, Imported from Livejournal and tagged astrochemistry, astronomical images, stars. Bookmark the permalink. 4 Responses to Betelgeuse! Betelgeuse! Betelgeuse!